The EFI offers a closed-loop, fuel-injection system that constantly monitors engine performance. Fuel injectors respond to the load on the engine, delivering maximum fuel efficiency for the conditions. 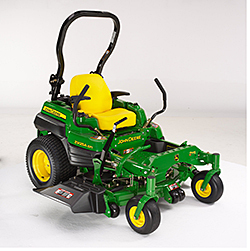 The unit offers a 54- or 60-inch 7-Iron™ mowing deck. The decks are stamped from 7-gauge steel for maximum durability and enhanced mowing performance. The mower also features electronic fuel injection, which provides up to a 25 percent fuel savings.